The chilly start did nothing to deter keen bidders from our 16th May 2018 Model Railway Auction and who could blame them with over 425 lots on offer! 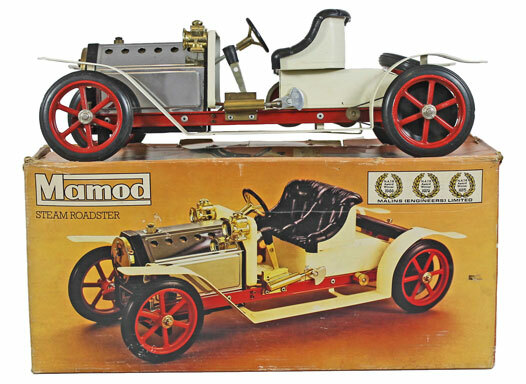 We started as ever with the Real Steam section and this unusual Mamod Steam Roadster No. SA1 which realised £96. Moving on to the O gauge section this ACE Trains Class A5 Pacific 4-6-2 LNER 2510 ‘Quicksilver’ No. E/4 locomotive and tender sold for £408. This lovely Bassett-Lowke LMS Princess Coronation Class 4-6-2 BR 46232 ‘Duchess of Montrose’ achieved a whopping £1,020! 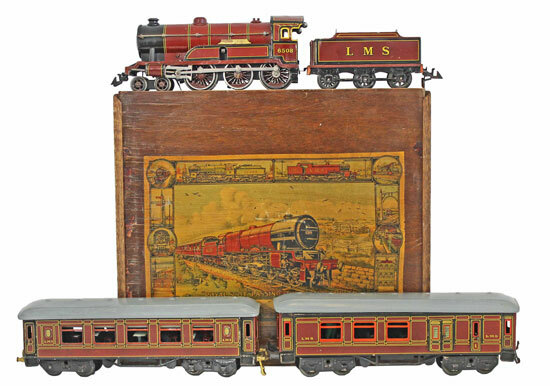 And this Bing ‘Royal Scot Passing through Wembley’ clockwork set realised a very respectable £480. In the OO gauge section there was an impressive and extensive collection of Wrenn locomotives offered. Highlights of this include this Royal Scot 6P 4-6-0 Class LMS 6141 ‘Caledonian’ locomotive and tender No. W2293 sold for £720. This Duchess 8P 4-6-2 Class BR 46221 ‘Queen Elizabeth’ No. W2299 locomotive and tender achieved £480. This Streamlined Coronation 4-6-2 Class LMS 6244 ‘King George VI’ No. W2302 locomotive and tender realised £480. And this A4 Class 4-6-2 LNER ‘Woodcock’ No. W2283 locomotive and tender sold for £840. Our next Model Railway auction will be held on Wednesday 18th July 2018. The full catalogue for this sale will be on our website in the next few weeks or keep an eye on our Twitter and Facebook pages which will include updates of our latest auction news.